Judge Rules NYPD's Stop-And-Frisk Tactics Violate Rights : The Two-Way In eight years, New York police made 4.4 million stops. Eighty-percent of the people stopped were minorities, and nine out of 10 times they were not charged with a crime. The judge has appointed an independent monitor to oversee the program. New York Police Department officers monitor a march against stop-and-frisk tactics used by police on Feb. 23 in New York City. 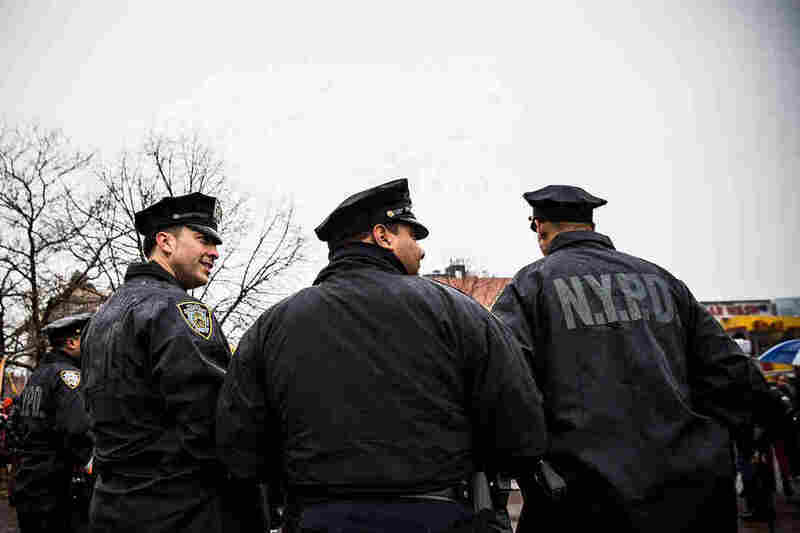 A New York Police Department procedure known as stop-and-frisk violates the civil rights of minorities and should be overseen by an independent monitor, a federal court judge ruled Monday. "In a decision issued on Monday, the judge, Shira A. Scheindlin, ruled that police officers have for years been systematically stopping innocent people in the street without any objective reason to suspect them of wrongdoing. Officers often frisked these people, usually young minority men, for weapons or searched their pockets for contraband, like drugs, before letting them go, according to the 195-page decision. "These stop-and-frisk episodes, which soared in number over the last decade as crime continued to decline, demonstrated a widespread disregard for the Fourth Amendment, which protects against unreasonable searches and seizures by the government, according to the ruling. It also found violations with the 14th Amendment's equal protection clause." "Between 2004 and 2012, the police made approximately 4.4 million stops under the program, which Police Commissioner Raymond Kelly and Mayor Michael Bloomberg have credited with helping drive down crime. More than 80% of those stopped were either black or Hispanic and about 90% of those weren't charged with a crime." NPR's Joel Rose previewed this class-action. He spoke to two plaintiffs who said they had been stopped and frisked multiple times by the NYPD. Neither had done anything wrong. "I remember squad cars pulling up. They just pulled up aggressively, and the cops came out with their guns drawn," Nicholas Peart told Joel. "I think it left me embarrassed, humiliated and upset — all three things rolled up into one." David Ourlicht told Joel: "[They] threw me up against the wall, took everything out of my pockets, threw it on the floor, dumped my bag on the floor, my books and everything. I had the guns to the back of my head. Like, I didn't want to look up or move because there were so many guns drawn. It's scary." As for what's next for the program, U.S. District Court Judge Shira Scheindlin said the independent monitor will "ensure that the practice is carried out in a manner that protects the rights and liberties of all New Yorkers, while still providing much-needed police protection." NBC New York reports the judge said she would not recommend immediate changes to the program, because she wants to wait for recommendations from the monitor. But she did order the NYPD to test out "body-worn cameras." "In addressing the NYPD's reasons for stops, Scheindlin said an officer must have reasonable suspicion 'that the person stopped has committed, is committing or is about to commit a crime.' 'Furtive movements,' a reason cited in some NYPD stops, is not sufficient, nor is simply being present in a 'high crime area,' the judge wrote. She also said a person cannot be stopped just for matching a vague description 'such as young black male 18 to 24.' "